In our previous post, we discussed a bit about Google First Look. Let us explore some more aspects of this here. To get us started, let us understand what passback impressions are. Let’s say, you have an ad network or SSP set up with Google Ad Manager as a priority 12 line-item. And, Google Ad Manager shows it has sent, say 100,000 ad requests to this Ad Network/SSP. However, don’t know whether all the 100,000 ad requests delivered impressions. We are not sure unless we check reports from that Ad Network/SSP and note what the fill rate is. But since Google Ad Manager won’t be having any feedback from Ad Networks/SSPs, it won’t be knowing how many requests are filled an ad and so it assumes the ideal situation which is, all requests are effectively shown an ad and hence if you pull the report in Google Ad Manager for that particular Ad Network, it shows impressions as 100,000; but in reality, that may not be the case. Now coming to Ad Network/SSP’s point of view, let us assume, that ad network/SSP couldn’t fill all the requests and its fill rate is around 70%. So in its report, it will show Ad Requests = 100,000 and impressions = 70,000 and hence fill rate = 70%. But what happens with the rest of the 30% of the ad reauests? It will go blank if you don’t have a backup to fill those 30%. Now back-up can be set in 2 ways, either by directly giving the tags of back-up network or house creatives to this Ad Network or by routing these 30% of the requests back to Ad Manager so that it can be filled by various campaigns you have set in the waterfall model. The latter is relatively easy and you will have clean reporting. The impressions from these returned requests are called passback impressions. So how can we set pass-back impressions? Google Ad Manager, at the time of generating tags for any ad unit, gives an option to generate passback tags as well. So if you check that option, you will have a pass-back tag which you can use in various ad networks. So from the above explanation, it is clear that pass-back impressions are remnant impressions and hence generally give low CPMs. Now coming to First Look – as we discussed in earlier blog, First Look allows preferred access to inventory for select buyers in Ad Exchange. These buyers have the opportunity to buy any inventory ahead of your reservation inventory, as long as they meet your selected floor price. So we can consider that First Look only takes premium inventory as it has the highest priority. Now because of our previous experiment, Experiment 4: Does stopping open-auction give better results overall & if so, why?, we had stopped Open Auction by delinking the Google Ad Manager (DFP) and Google Ad Exchange, we were treating Ad Exchange as an Ad Network by running it in Price Priority Line Item, which means, since AdX and Ad Manager are not linked, Google Ad Manager wasn’t having feedback and hence for Google Ad Manager, AdX was just like any other Ad Network! We had created separate passback ad units to capture non filled requests from Ad Exchange and since it was not targeted in any Ad Exchange line item, it was eligible for First Look! To our surprise, First Look started filling passback requests with a CPM three times higher than the average CPM given by Ad Exchange in Open Auction! So, the impression flow was like this: Sponsorship > Standard > Price Priority Line Items / Ad Exchange line item (Price priority) > First Look (from Passback impressions) > House. Whereas the normal flow would be something like this: First Look > Sponsorship > Standard > Price Priority / Ad Exchange (Dynamic Allocation) / House. So whatever revenue we were generating from these First Look impressions was totally incremental and whatever was left unfilled from First Look was filled by other campaigns or house, so that we made sure that no requests were going waste or blank. But this was a surprising behaviour from Google where we thought First Look only won premium inventory and we couldn’t imagine it filling rejected requests (Passback requests) and that too, they were rejected by Google AdX itself! 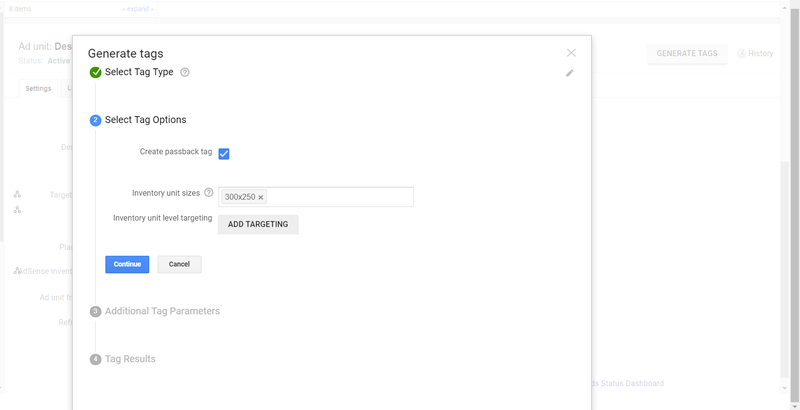 Overall, we have learned a lot through these experiments about Google Ad Manager and Ad Exchange and we still think there’s a lot more to learn.